﻿ A few more motorcycles. Museum Entrance, Exterior Interior view, low angle. Unrestored motorcycles 'n various umm... junk, awaiting restoration. Interior view, low angle. Take a cut lunch and a bottle of water... it goes on forever. If you're *not* a motorcycle enthusiast, find a shady spot and take a good book. They won't be back soon... Motorcycle Library Motorcycle Museum Library North Hall - Just a few of the dirtbikes on display. North Hall - Eastern Bloc Collection Entrance Hall. Daimler and Howall in Foreground Part of the British Exhibition British Bikes of the 20s and 30s Vincent Section; In the background, several American machines. One of the vast halls of motorcycles A few more motorcycles. The West Wing is simply enormous, with hundreds of motorbikes. British Lightweights An extremely rare and beautiful motorcycle, the Militaire is not to be missed. Part of the Japanese Collection. 50cc Mopeds stacked to the ceiling. I'm lost. Don't know where this collection of Kawasakis is. West Wing, Yamaha section on the left. 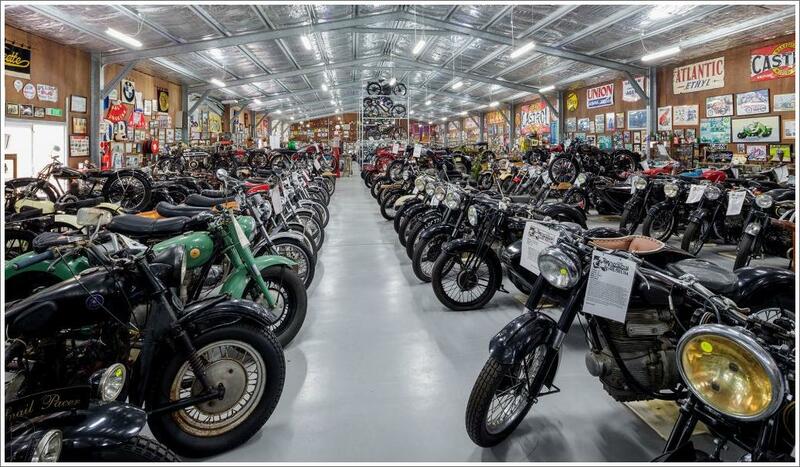 Part of the Japanese Motorcycle Collection West Wing with a group of 60s two-strokes in the foreground Dividing wall of motorcycles European sports bikes front and centre. Racing Section Racing Section, including sidecars A Manx Norton in the Racing Section Racing Leathers of Famous Australian Riders Ron Toombs' Race Leathers.